It might be tempting to try for the “Happy Gilmore” swing when you step up to the tee. Besides, hockey players get a lot of power out of those slap shots, right? But golf is a different game. Getting your golf swing speed higher could use a little bit of hip. But the extra thirty yards a “Happy Gilmore” shot would get you isn’t worth the risk of shooting your ball the wrong way. And, really, even pro-golfers only hit the fairway 60% of the time. Why lower your chances at getting closer to the hole? Then how are you going to get more golf swing speed if you can’t hop to it? Let’s look at some tips behind driving that ball accurately and faster down the fairway. If you’ve ever played Baseball, you know that the power and speed of your bat swing come from your hips and your ankles. You stand with your feet wider than shoulder width apart and then pivot on your toes. This twists your hips and drives all of your body’s torque into the swing. But golf swing speed comes from a very different part of your body: your shoulders. This is due to the design of a golf club. With a baseball bat, the sweet spot sits about one-half to two-thirds of the way up the bat. A golf club, on the other hand, has a sweet spot on the end of the club, on the head. Every bit of the speed and power you drive into the ball in golf translates through the torque of the shaft and travels down into the head. The torque isn’t in your hips like in Baseball. It’s in the instrument you’re swinging. This is why pro-golfers look like they’re swinging slow but get massive swing speed at the end of that club. They know how to use physics as opposed to brute force to improve their golf swing speed. 2. How Fast Is A Fast Golf Swing Speed? Yeah, we do keep saying “fast” when we say golf swing. But what does that even mean? When we say fast, we’re talking actual miles per hour. Fast isn’t necessarily the World Long Drive championships. Although, while that is “fast,” those guys sacrifice accuracy for raw power and distance. Maintaining golf swing speed while remaining accurate is how the pros win tours. Average PGA Tour speeds range from 115-125 mph. These players gain these speeds after millions of swings both on the course and off the course. While you may not gain this speed right away, it is in the realm of possibility. Grab one of your irons and turn that club upside down. But you’re not going to tee up this way. Instead, we’re going to practice. Think of this like your scales when you learned piano as a kid. Get into your golf stance. Now try your typical golf swing. If you don’t hear a “whoosh” sound when your club handle hits halfway through your swing, you’re not getting enough speed. Now, make sure that when you pull back on that swing, your wrists bend behind your head. Just like the beginning of a baseball swing, you’re cocking that club back. The wrists add an extra fulcrum to the swing. Even the little bit of action in your wrists translates to a bit more golf swing speed. This won’t be there if you keep your wrists straight. Why Do You Want To Hear The Whoosh At The Bottom Of Your Swing? Because you want the maximum amount of swing speed happening when you hit the ball. It’s that simple. If you hear the whoosh too late, you won’t have maximum speed and momentum on the club head driving that ball. This isn’t Hockey or Baseball. You’re not going around checking other players into trees or sliding into the eighteenth hole. And you’re definitely NOT using the same grip. You should be particular about your golf grip if you’re at all worried about your golf swing speed. Most people grip the golf club wrong. A lot of people actually place the end of the club’s handle inside their palm. Choke up at most an inch on that club. The end of the club should stick out a very small bit above the back end of your upper hand palm. And when you swing with this grip of your upper palm gripping the handle and not the end, you’ll be more in line with your golf swing. What do we mean by this? If you find that your golf head is pulling forward of your hands mid-swing, forcing your wrist to bend forward, you’re holding the club wrong. But if you feel like your wrist is in control of the head and you end up “flicking” your club with your wrist. You’ve got it right. Remember, you had that extra fulcrum at your top swing by cocking your wrist back. You now have another fulcrum at the bottom. Each time you are in full control of your swing. 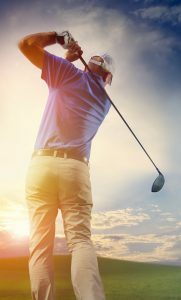 While drinking beer and making golf a lazy sport is popular, if you really want to increase your golf swing speed, you have to change how you see the sport. Ditch the beer to mouth curls and start working on those real iron curls. Or get some workout bands and do some wing flaps. Your power will come both from careful control, practice, and shoulder muscle. As you’ve probably noticed, getting the most out of your golf swing is all about controlling the club in just the right. Learn to do this, and you’ll have an awesome and accurate swing. Have you found some effective ways to increase your golf swing speed? Let us know in the comments below. And, as always, don’t stop living on greens. 2 Pings/Trackbacks for "How to Easily Increase Your Golf Swing Speed"